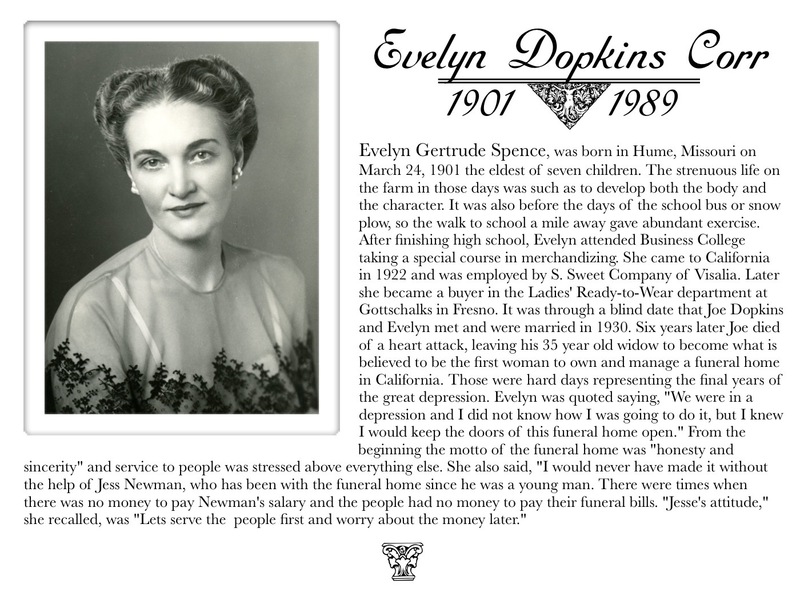 Since 1895 Dopkins has handled the funeral service and care of breaved families through their loss. 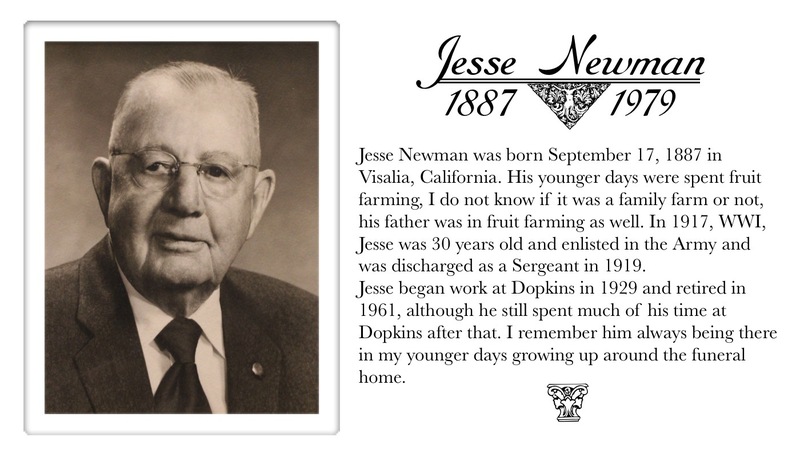 Although the faces of Dopkins have changed over the years, our goals and pourpose have only grown in our strive to serve and care for the people we meet. George was born on September 13, 1854 in Randolph, New York to Joseph Case Dopkins 1820-1894 and Sarepta Cecilia Barnum 1821-1917. George was 4th in line of their seven children. And in the late 1860's George's father Joseph moved his family to Bethany, Missouri where they farmed. George married Eliza J. Gillespie August 5, 1877, and started his own farm in Jefferson, Missouri. Five years later Eliza died of consumption. After her death George moved to Traver, California changing his career from farming to carpentry, building furniture. He opened up a furniture store in Traver with a partner. On October 26, 1887 George married Clara Irene Peacock. They had three children, Mary 'Maye', Emma, and Joesph, in that order. In 1895 George officially began Dopkins Funeral Chapel. Dopkins Undertaking Parlor started in the back room of the furniture store George Dopkins and his partner own. In this photo of the furniture store is George Dopkins and his son Joseph Dopkins. 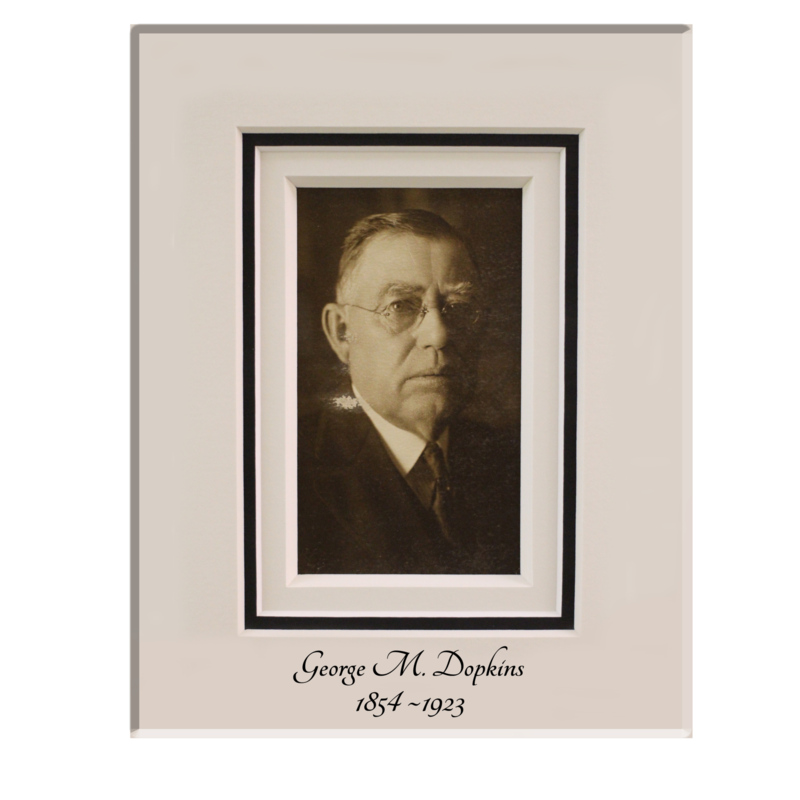 Not long after George started the Dopkins funeral business in 1895 and made his break from the furniture store and open his own place. John DeFehr Sr. had passed away and this is his family. We are not sure if this is before or after the funeral service. If you could enlarge the photo you could see the buildings across the street reflected in the window putting this location on "L" Street downtown Dinuba. You can also see the name Dopkins to the right side on the glass window. We think this is the first location dedicated strictly to the Funeral business. In 1920, George decided a new building was needed to accommodate the growing community. The mortuary was built on the corner of J and Kern st., where we still operate today. This photo is looking north on Kern St., Dopkins new building is in the lower left hand corner. It is written on the picture that this event happened April 2, 1924 and was the funeral service for Helen Penner at Dopkins Chapel. I am really fasinated by this photo, and wish I had more information about this funeral coach Dopkins owned at the time. In 1930 Joe Married Evelyn G. Spence. Evelyn married J. Wilfred Corr in 1944 who became her constant companion though not connected with the business directly. He was a LT. in the Naval Reserves and served 21 years as Executive Director of the California Funeral Directors Association and many many other committees, societies, clubs and organizations. Wilfred died in 1969, he was 73.They had 25 years together.